Bismarck’s Big Boy Restaurant (previously known as McDowell’s Big Boy) has been a popular local fast food icon since Harley McDowell founded it 1954. In addition to being the first local drive-through (A & W Rootbeer predated in 1950 as a drive-in), it is the city’s oldest continuously operating restaurant. That same year, it also became only the fourth KFC franchisee, with its founder ultimately becoming a close friend of “Colonel” Harland Sanders. Other than the name and famous statues adorning its lawn, little about the local Big Boy resembles that of the today’s national chain. In addition to its unique menu, it is perhaps the only remaining Big Boy to include a drive-through. Nationally, Big Boy abandoned the drive-through format in 1964. The Bismarck restaurant features no indoor seating whatsoever – although its former downtown location did. Restaurant advertising frequently pokes fun at its popularity, imposing a “limit of 45” on its menu items and using such catch phrases as “just get in” aimed at its frequently backed up line. 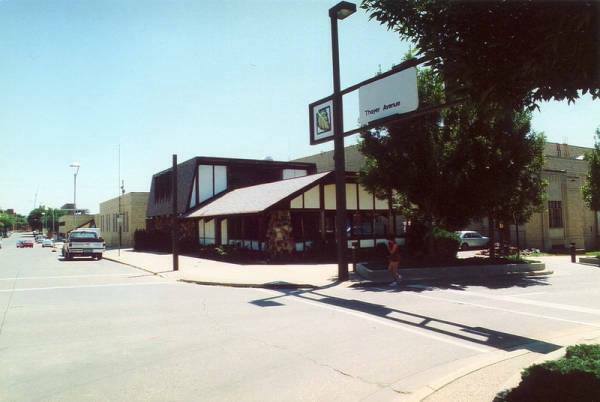 Other regional locations also once existed in Fargo, Minot, Dickinson, and Medora, but the original Bismarck restaurant remains the sole survivor. Big Boy’s founder, Harley McDowell, is the namesake of McDowell Dam Recreation Area after he donated the land exclusively for recreation purposes. The Bismarck Big Boy features a traditional fast food menu, emphasizing burgers and chicken buckets. It is mostly identified for its Alpine Burger, Pizza Burger “Flying Style” (cooked in a sandwich press), and Hot-n-Tots – a cinnamon cola. The restaurant is also known for its gravy fries. The Big Boy Original, allegedly the inspiration for McDonald’s Big Mac, is the only carry over from the national chain. Unlike its national counterparts, the Bismarck Big Boy does not featuring breakfast items. 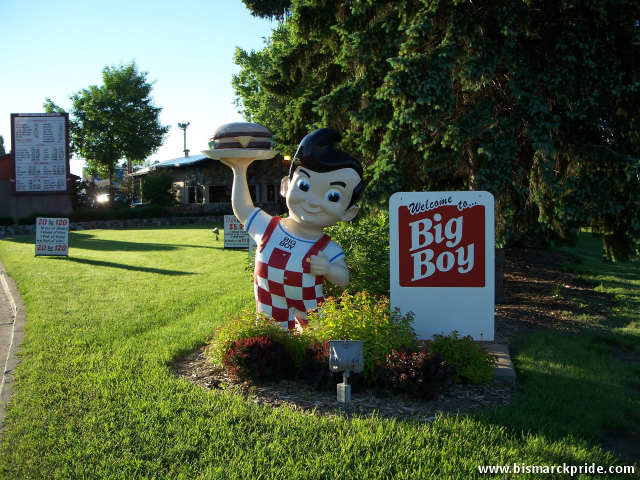 Bismarck’s Big Boy was founded in 1954 by traveling salesman Harley McDowell, who had seen one in another state during a business trip and decided to open one in Bismarck. 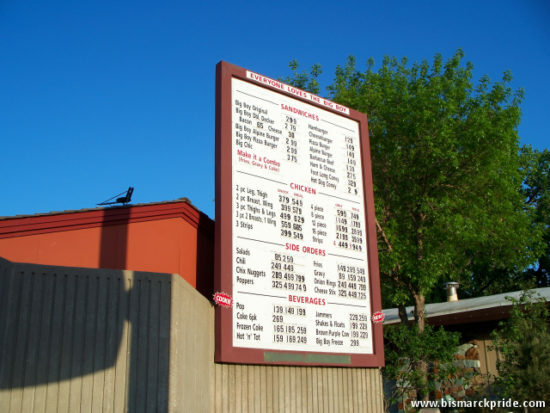 It was Bismarck’s first drive-through restaurant (although it was still referred to as a drive-in). Also in 1954, the restaurant became only the fourth KFC franchise. Initially, McDowell operated without a formal licensing agreement from Big Boy. Robert C. Wian Enterprises – the franchising arm of Big Boy – sued McDowell in 1959 for his unauthorized use of the name and concept. The suit particularly focused on McDowell’s use of the iconic Big Boy double-decker sandwich. The suit requested that McDowell cease use of the Big Boy name and for a judgment to be filed for retroactive payment. The suit was settled, allowing McDowell to operate as a formal franchisee. McDowell sold the Bismarck restaurants to Stan and Bonnie Rothenberger in 1978, who continued ownership until at least the late 2010s. While Rothenberger, who was manager of the Municipal Country Club, was not the highest of five bids for the enterprises, McDowell selected him for “his established reputation for honest business and quality food service.” The agreement called for McDowell to remain on the board for seven years. As of 2017, it is owned by Chad Wachter. Since acquiring the restaurant, Wachter has launched several improvements, including an easier-to-read menu board and a planned second drive-through exit. A second location opened downtown in 1970 on the southeast corner of 6th Street and Thayer Avenue. Contrary to its original location, the restaurant included indoor seating and no drive-though. It remained here until 1982, when Q&R Clinic commenced a major expansion project that included a six-story tower and closed off a block of Thayer Avenue. Big Boy then relocated across the street to 210 N 6th Street, when it was appropriately renamed “Across The Street Restaurant.” The building was originally home to Ressler Cafe. By summer 1988, the restaurant evolved into Burgie’s restaurant. Burgies still offered some Big Boy items, including the Alpine Burger, with an expanded menu that also included breakfast, soup, and beer. Burgies closed in December 1990 when Q&R again asserted control of the building. McDowell also established Big Boy restaurants outside of Bismarck, including in Medora (in 1972), Fargo, Dickinson, and Minot. The original Bismarck location is the sole survivor. In 1954, the same year as Big Boy’s establishment, McDowell became only the fourth franchisee of Kentucky Fried Chicken (KFC). For years, both restaurants were incorporated within the same building in a hybrid format. McDowell ultimately became close friends with KFC founder “Colonel” Harland David Sanders, who often visited McDowell in Bismarck. In the early 1970s, after Sanders sold off KFC’s franchising operation and the chain became more prominent, the company’s new ownership took up issue with McDowell operating both franchises together. The two entities were split when McDowell sold the restaurants in 1978, with its new owners opening a free-standing KFC location adjacent to Gateway Mall, where it remains today. A second freestanding KFC location, on the southeast corner of 3rd and and Bowen, opened in 1981 upon converting a former Texaco station on the site, which was more recently housing Lancelot Realty. That location was demolished in May 2011 for HuHot. Despite ending its formal affiliation with KFC, Bismarck’s Big Boy continues to sell menu items often associated with KFC, including gravy fries and chicken buckets.